CLZ Barry also works great with the web-based Connect editions of the Collectorz.com software. To use CLZ Barry with the Connect web-based software, make sure the following Settings are set correctly. Don’t worry, these are the default settings, so it should work right out-of-the-box. Instant scanning and sending OR sending in batch ? Connect deals with sent barcodes the same way, whether you send em directly when scanning, one-by-one, or in batch. Just put the cursor in Connect’s Barcode or ISBN box and start sending. Click the “+ ADD” button on the toolbar. in the Add screen, click the “ADD BY BARCODE” tab. Connect’s built-in Buddy will automatically connect to the server, indicated on the right. Make sure the cursor is in the Barcode/ISBN box. Now, make sure both Barry and Buddy show as “Fully Connected”. On the top right you should see “Ready to scan”. 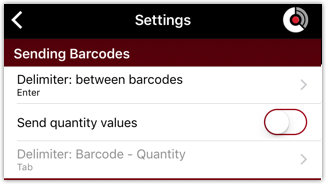 Start scanning barcodes and you will instantly see them appear in Connect’s barcode queue.